A lot of people work from home these days. If you’re one of the home-based workers, you know how important the workspace actually is when it comes to your productivity and efficiency. But what happens when you simply don’t have any extra space for your own home office? Setting up your work corner in the kitchen or dining room is out of the question. The living room may be an acceptable choice, but things can get pretty busy and hectic there, which can disturb your concentration. In that respect, the bedroom is definitely the most plausible option. If you want to learn how to functionally fuse your bedroom with workspace, check out the following ideas. The most important issue to address when setting up your workspace in the bedroom is to avoid these two different aspects of your life clashing with each other. Not only does this look messy and awkward, but you won’t be able to utilize the best of your work productivity or rest comfortably when it’s time for sleep. If your bedroom is not divided into several areas, you can separate your workspace from the rest of your bedroom with curtains, screen doors and other interesting dividing techniques. 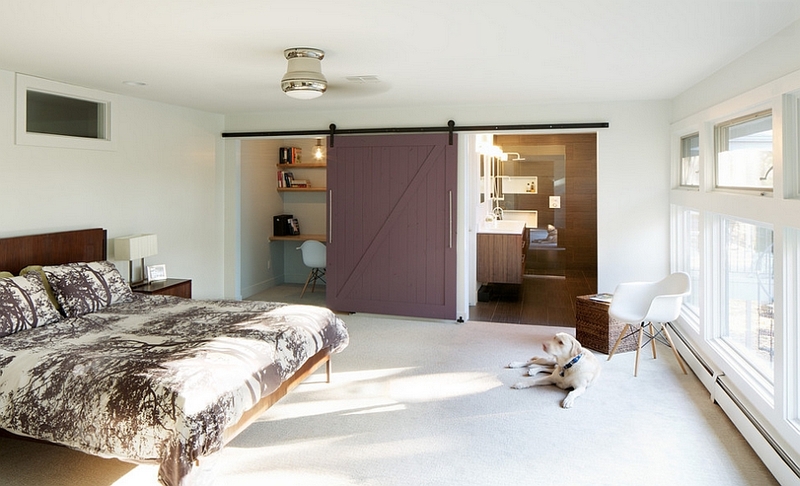 It’s not only enough to create a physical separation between your bedroom and workspace. If you can see your bed from where you’re sitting during your working hours, you will still struggle with work efficiency. In that respect, the best option is to position your desk so that it looks at the wall or window. Whatever position you find suitable for your needs, it’s essential that you have your back to your bed all the time. If you’re experiencing some trouble regarding the really limited space you have in your bedroom, then create more of it! One interesting way to add more space for your working area as well as separate yourself from the rest of the room is by setting up your desk, computer and other work essentials into your wardrobe. This means that you will have to reorganize your clothes so that they could fit in another wardrobe, but if you manage to do that, you’ll be all set up. Once you’re done with work, you can just close the wardrobe doors and relax in your sleep chamber. Apart from functionality, you should also consider the stylish aspect of both your bedroom and workspace. While you shouldn’t overstuff your working area with decorative pieces and mementos, it shouldn’t be completely plain either. Still, even though you should do your best to separate the workspace from the rest of your bedroom, the items and décor details that you use shouldn’t look mismatched. In that respect, try to introduce some individuality to your workspace with self-adhesive wallpaper, plants, shelves and other details that would still keep the harmony of the overall décor style you have in your bedroom. The desire to make your workspace as functional as possible can make you unaware of the fact that your bedroom comfort is equally important. If you want to make this arrangement work, you need to be satisfied with both your bedroom and workspace. Therefore, make sure that your bed offers proper support. You can look into Bedworks quality mattresses online if you feel pain after waking up, declutter your bedroom of unused clothes and excess detail, put up motivational paintings, and use cushion and bed covers that suit your personal taste. Of course, don’t forget to introduce a bit of greenery to this area for some added benefits. As long as you don’t favor one aspect over the other, keep the two areas separated, but hold onto the same style and décor technique, you can effectively fuse your bedroom and workspace together. You’re doing all of this for yourself, so make sure that you always keep in mind the things that inspire, motivate and soothe you the best. This entry was posted in Home, Car, Yard, and Pets, ~Decorating and tagged bedroom, decor, inspiration. Bookmark the permalink.